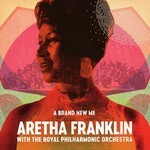 A Brand New Me: Aretha Franklin (with the Royal Philharmonic Orchestra) pairs classic vocals from some of the most iconic songs that the Queen of Soul recorded for Atlantic Records with new arrangements performed by The Royal Philharmonic Orchestra. The result is another timeless record that retains the soul, groove, and gospel power of Franklin's revered talent. Among the standout tracks are newly re-imagined versions of classics like the Billboard #1 R&B hits "Respect", "Think", "Don't Play That Song (You Lied)", and "Angel". Nick Patrick says: "There is a reason that Aretha Franklin is called the 'Queen of Soul.' There is nothing more exciting than that incredible voice taking you on an emotional roller coaster ride through her amazing repertoire of songs. To have the opportunity to work with that voice on this project has been the greatest honour and to hear a symphony orchestra wrapped around those performances is breathtaking." Don Reedman says: "I was 15 years old when a song came on the radio called 'Rock A Bye Your Baby With A Dixie Melody.' It blew me away; the power, the soul. The feeling that went through me got me hooked on Aretha and I have been ever since. To be able to make this album and be able to select songs from hits like 'Respect' to 'Think' then blend them with classic songs like 'Let It Be' and 'Border Song' and create an album which is versatile and fresh is truly an honour".